We are proud to announce the next stage of KISS’ 40th anniversary celebrations, with the release of a Deluxe Edition of the 1977 U.S. platinum album, Love Gun, on 2CD and digital formats on October 28th. 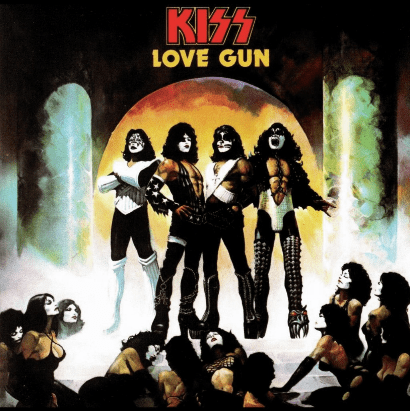 The band’s sixth studio recording, Love Gun was the first album to feature lead vocal performances from all four original band members, and the last studio album with the original KISS line-up. Love Gun has since gone on to sell more than four million copies worldwide. The 2CD / digital edition includes the complete original album re-mastered on the first disc, featuring such classics as the title track “Plaster Caster”, the song inspired by Cynthia Plaster Caster, the groupie famous for taking casts of rock star genitalia; “Shock Me”, written about Ace Frehley suffering an electric shock during a concert in Lakeland, Florida; “Christine Sixteen”, and “Then She Kissed Me”, the band’s cheeky, gender-switching cover of the Crystals’ 1963 hit penned by Jeff Barry, Ellie Greenwich and Phil Spector. The second disc is made up of rare, previously unreleased Love Gun demos of “Plaster Caster”, “Then She Kissed Me”, “Tomorrow and Tonight” and “Much Too Soon”. Also, the first four lines of the demo “I Know Who You Are” eventually evolved and became the song “Living In Sin”. A glimpse into Paul Stanley’s creative process is demonstrated in “Love Gun (Teaching Demo)” with Stanley talking through the various chords of the song after writing the song with the next version – “Love Gun (Demo)” – being the complete demo performance. “Reputation”, the only previously released demo, was originally included on this year’s KISS 40 compilation. Also included is a 1977 interview with Gene Simmons, as well as three never-before-available live tracks from the KISS show at the Capitol Centre, Landover in Maryland U.S.A. from December 20, 1977 – “Love Gun”, “Christine Sixteen” and “Shock Me”. The package also includes liner notes written by Def Leppard’s Joe Elliott.